Dew Piling have recently completed a £213,000 contract for Morgan Sindall at Rotherham Community Health Centre Building and adjacent car park in South Yorkshire. The works involved repairs to a canal wall which had collapsed in 3 places over a 105m stretch. 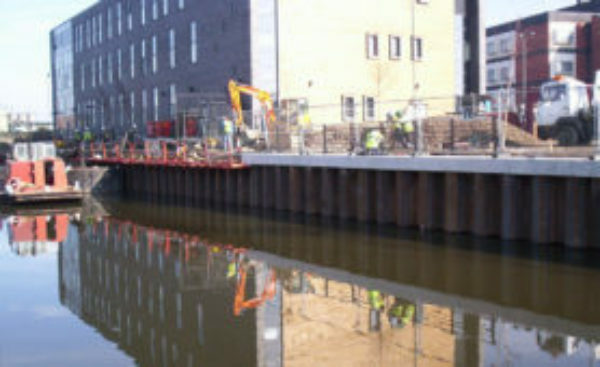 The six week scheme required the installation of sheet piles across the front of the existing masonry wall to prevent further collapse and when the already failed sections were removed from the canal bed the sheet piles would form a continuous retaining wall approximately 3 meters above the water level. Dew Piling were contracted to design and install sheet piles through the canal bed clays and founded within the dense sands and gravels below to provide a cantilever wall capable of retaining the existing Health Centre car park. Some 175 sheet piles up to 10m long were driven to retain the car park and prevent any erosion from underneath the building itself, despite the fact it was self-supported on concrete piles themselves founded in the gravels. Access was a major issue as all deliveries were across the existing car park which was protected with timbers to prevent any damage and all vehicles were only permitted outside the 7.30am – 5pm Health Centre parking times. The installation process was carried out in 2 sections each adopting a different method of pile driving due to the tight access constraints in front of the building but similar in that each adopted high frequency vibratory equipment to displace and penetrate the gravel bands. The less restricted area was installed using conventional crane suspended methods and the section directly in front of the building utilised an excavator mounted hammer which had to be lifted onto a canal based barge with a 250t crane at 4.00am in the morning.